While the CDC began making recommendations on dental waterlines back in 1993 and ABC's television show 20/20 did a show called "Dentistry's Dirty Little Secret" in 2000 proving the unfortunate and unfavorable comparison of dental water quality to that of toilet water, it has taken time for this vital part of infection control to really be embraced. But when a total of 96 children were reported with bacterial infections tied to routine dental procedures drawing water from unclean waterlines in 2015 and 2016, industry leaders, dental boards, and regulatory agencies began taking greater notice. Since then, more and more dental leaders and top professionals are putting dental waterline safety higher on the priority list. And that's because unsafe waterlines come down to a simple reality: waterlines that do not meet the *guidelines for safe water are in conflict with the standard of patient care, let alone the high standards most dental practices strive for. What is in Your Dental Practice's Waterlines? Well, in some ways, it depends. If you're dedicated to an effective treatment protocol and you are testing your lines, you’re probably seeing great progress (if not, call our team for a free consultation). If you're just getting started on DUWL contamination maintenance, there will undoubtedly be a lot (likely in the multiple thousands) of bacteria colonies attaching, reproducing, and spreading inside your waterlines. And for the record, 61% of dental offices that treat will also have at least one line where this is true. No, it won't be because you don't hold your patients safety in the highest regard; it will simply be because dental unit waterlines make the perfect environment for biofilm growth. We often think of DUWLs as rivers - the line is narrow and water is forced to flush through the line. But in reality, they are much more like ponds. Think about it: dental water lies stagnant inside of your dental unit waterlines for 23.5 hours on average every single day. When you use your waterlines, it is usually for a few of seconds and then it sits between and long after patient visits. Even when the water is moving, it only travels roughly 2-8 inches depending on the device and the use. The long narrow structure, plastic material, and largely stagnant environment of your waterlines allows potentially harmful bacteria to attach, grow, and spread. These biofilm act as microbial reservoirs, collecting and growing increasing amounts of potentially dangerous bacteria within the dental waterline system exponentially – meaning, the more you have at the beginning of each day, the faster they will be able to reproduce and spread throughout the rest of it and overnight. The good news? 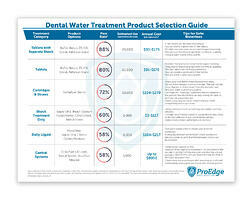 There are a variety of dental water treatment products available to help control and clean the DUWL environment. Now, not every treatment product is highly effective, and every one of them requires consistent and proper use to be as effective as possible, but that's why we've done the qualitative and quantitative research to help you know what works best. What DUWL Treatment Options Do I Have? Dental water treatment can be split into two categories: waterline shock treatments and continuous treatments. Waterline shock treatments provide a "shock" to the dental unit waterline system. These contain a high-level disinfecting agents like hydrogen chloride (bleach), hydrogen peroxide, silver or iodine. These products are made to best eliminate biofilm from your waterlines without damaging your equipment. Shock treatment products are important for every waterline cleaning protocol because, performed properly, they rid your lines of the nearly all bacteria. However, used alone, they allow bacteria to grow back quickly because there's nothing to control the environment between shocking protocols. Even clean lines can grow over 200,000 CFU/mL in just 5 days. And because dental water must go into the patient's mouth, it cannot contain these high-level disinfectants during procedures without harming patients or delivering unwanted taste and odor. That's where continuous waterline treatment products come in. 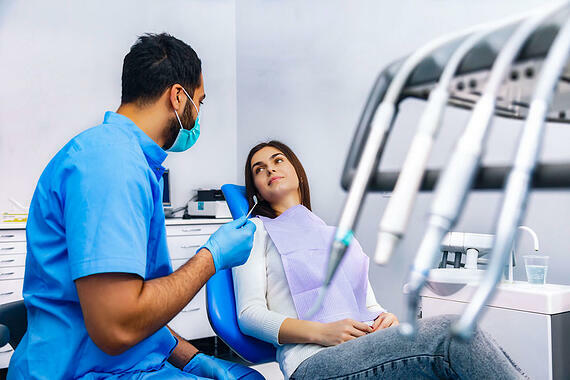 Continuous treatments, as the name implies, are continuously present in your dental waterlines and are used to maintain your dental unit waterlines. They utilize low-level antimicrobials to stunt bacterial growth and protect the already safe dental waterline environment. These products utilize lower levels of silver, chlorine, iodine, and other agents to fight bacteria in your water bottles and inside your waterlines. They are safe for direct patient care and do not create odor or taste problems. In short, shock treatments are best used as a short-term and powerful assault on biofilm to get dental waterlines clean as quickly as possible. Continuous waterline treatments are the consistent solution to keep your waterlines safe every day. How Do These Different Treatment Options Work? As treatment agents come into contact with biofilm bacteria, they latch on, transferring a virus-like strand of DNA from treatment cell to bacteria cell. This new DNA code is not compatible with the bacteria cell, so it soon explodes. Treatment cells continue this process as long as they are present. The major differences between the two types are antimicrobial level and usage interval. Shock treatments contain high levels and are used at intervals of weekly, every 8 weeks, or quarterly. Continuous treatments have low-levels and are used every day. What's the Most Effective Kind of Waterline Treatment? Every treatment requires close attention to the instructions for use, but not all are created equally. In a new peer reviewed article by John A. Molinari and Nancy Dewhirst, data from over 22,000 real-world dental water tests were used to determine the most effective treatment protocol. You can download their 2 CE credit E-Book here or download our Dental Water Treatment Product Selection Guide for a detailed product rundown including tips better water safety for using each type. The most effective treatment protocol found was a combination of daily tablets with a separate shock treatment, passing at nearly 90%. Overall, 31% of all tested waterlines failed to meet the CDC standard for safe water (≤500 CFU/mL). 61% of offices had at least one of their lines fail to meet this standard. We recommend reviewing the data and product tips closely. Our team has helped thousands of offices achieve safe water after a failed test, offering our knowledge on every product to help dental professionals protect their patients and their practice. How Do I Get Started Cleaning My Dental Waterlines? First, recognize that bacteria never stops. As long as you are using water in your procedures, there will be biofilm within trying to attach, multiply, and spread through your waterlines. To keep patients safe from bacterial infections, a consistent and effective dental waterline treatment protocol is needed. You can get started with our free Safe Water Starter Kit which includes BluTab, a shock protocol, and additional resources or get a baseline for where your waterlines stand by testing your water today. Beyond that, the lab team at ProEdge Dental Water Labs is always available to help. Call us at 888.843.3343 or email info@proedgedental.com if you have questions.